Twenty acres not far from Hwy 101; off of Spyrock Rd in Mendocino County. A small cabin, pond, and several buildable flats, the property is an excellent starter ranch for the outdoor enthusiast. Good neighbors, travel trailer, several garden sites and a storage container included. Take in the north eastern views from your perch. Located less than a mile out Highway 162 sits this this 40 acre parcel. Property needs work. There is a permitted house and septic on property. There is no developed water. Possible undeveloped springs on the property. Long established foreign car repair shop on the Mendocino Coast. Owner ready to retire so this is a great opportunity to take over this well established shop. Great location, parking is off street. New lease will need to be created. Owner will work with new owner to make for a smooth transition. Development Opportunity! This 40 Acre parcel has 3 Parcel numbers and the property could be split into two 10 acre parcels and one 20 acre parcel. Great views with a wonderful mix of trees/vegetation. Less than 1 mile out Highway highway 162. Don’t miss this fabulous investment opportunity! NICE BIG LOT, AND NEW LOWER PRICE! Build your dream home on this beautiful 2.7 acre wooded lot at the top of Humboldt Hill Road!This property has end of the road privacy, mature spruce and alder trees, and lots of room for animals large and small. The flag lot is fully fenced and cross fenced. Public utilities are located conveniently at the street on Worthington Drive. Private Country feel, yet just minutes from downtown Eureka.Come and see! Located only 15 minutes from the Covelo Valley in northern Mendocino County, and off a paved county road, this picturesque 12.5 acre, County AND State Licensed cultivation estate features abundant, jaw- dropping views, well maintained interior roads, and rolling oak-studded hills. This property has a well kept custom two story cabin, a detached barn, a detached basement for drying/curing, a permitted 5 gpm solar powered well, a pond, Solar powered everything with a back up MQ 25kw/90 amp diesel generator that kicks on and also charges solar batteries. Permitted for 10,000 sqft of flowering and 12,000 of nursery. The highlights of this property are the two 1,800 sqft GreenHouses. 1. GroTech Green House fully loaded from AC to heater, automated dep curtains and 9 brand new Gavitas on light rails for supplemental lighting. This greenhouse has everything under the sun allowing to control it remotely from you laptop. 3.The remaining 6,400 sqft is used for full-sun outdoor cultivation. Each of the 200 – 400 gallon smart pots are placed on pallets. Allowing you to move them around easily. As you know less than 1 percent of California Cannabis Farms are currently permitted. This farm allows you to be a leader in the future of this multi-billion dollar industry. Property produces 1,000 units annually. Asking $695,000 for property and permits. Here’s a great property to get up and running in the emerging cannabis industry, over 12 acres zoned AG with a large updated 4/2 home, plenty of flat wide-open usable land, 2 wells and creek frontage! Fully licensed with a Trinity County Type 2B Mixed-Light Cultivation License in hand allowing for 20k sf of canopy area. 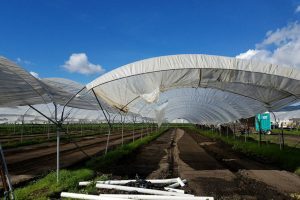 The designated cultivation area is ready for your development – but no worries – no need to cut a single tree or do any drastic earth work – this is as easy as it gets to develop however your needs demand. BONUS!!! Sellers have the ability to secure cannabis-friendly financing, AND they are willing to add fully automated greenhouses to the property and add it to the sales price and roll it into financing if buyer is interested in that option. Located on a paved county road just 10 minutes to town makes this a convenient location. With the least expensive power in the state of California, and with no county taxes on the cannabis industry currently – this is a great opportunity to have a jump start on your new business! Fridge, washer & dryer, and furniture in house included in sale, PLUS A BACKHOE! Great financing options available on approval of buyer & terms! INTERIM PERMIT AND CALIFORNIA STATE TEMP PERMIT IN HAND FOR 43, 560 existing OUTDOOR and 3, 600 of existing MIXED LIGHT. Property is neat as a pin with permitted well, greenhouses, yurt, barns and cabins. Owners have created this farm with permitting in mind and have worked hard to do all the right things. This is the farm you are looking for in the sunshine. The acre of outdoor cultivation offers low overhead and the option of growing large. Call today to schedule your private showing. Seller carry option available. 40 Acre lot located on a beautiful mountaintop at the end of a road in Mendocino County. Million dollar views and just 5 mins away from downtown Ukiah –location, location, location! Fully permitted with both state and local licenses allowing the max of 10,ooo sq ft – outdoors; this turnkey farm features 9 building pads (4 of them are developed and ready to go– pots soils, irrigation included), permitted well with 2×2500 gallon storage tanks and septic. Off grid power, has some solar, generator not included. There are also additional building permits approved for a 2500 sq ft building with an indoor shop and living space. The proposed building has potential use for indoor cultivation, drying, harvesting, processing, manufacturing, ,microbusiness, storage, work space, etc. Currently there are no dwellings. Space is suitable for a trailers/5th wheels (not included) with access to septic hook-up. Asking $420K for a 1 year lease with option for long term lease;payment is required up front. Once lease is secured, landowner will need limited access to complete building plans (as shown in photos). Lessee will need to comply with state and county regulations to keep permit in good standing. This is an amazing property with unlimited potential. Develop and customize to your business and/or lifestyle needs. Lots of room, lots of space, and easy access close to town. Keywords: eco retreat, cannabis resort, cannabis tourism, distribution, manufacturing, cultivation, processing, permits, licensed, 10000 sq ft, outdoor, indoor, off grid, solar, land for lease, hoop houses, outdoor work space, warehouses, micro business. 9+ acre Santa Cruz County property is eligible for a CLASS CA ZONED CANNABIS CULTIVATION LICENSE. The property is zoned CA (Commercial Agriculture). The Tax Assessor records state the house is 1416 SF with 2 Bedrooms and 1.5 Bathrooms, and with a 572 SF two car garage. The home was Built in 1954, and has been remodeled. There is a large detached BARN, and the farmland is CERTIFIED ORGANIC for 12 YEARS through CCOF ( www.ccof.org). There are 6 acres of HOOP HOUSES, valued NEW at approximately $100,000, to be included in the sale. The property is located at the base of the Santa Cruz mountains. There is a shared well that serves the residence and the existing agricultural operations. Seller is in the process of arranging for a new AGRICULTURAL WELL to be drilled at his expense. This 9+ acre CA ZONED parcel allows for an anticipated cannabis cultivation CANOPY of up to 2.5% of the parcel size on this property, allowing more than 10,000 SF for a single license. This zoning is expected to allow more than 1 license on the property. For CO-LOCATED Licenses on this parcel, a canopy of up to 5% of the Parcel size is anticipated, which is more than 20,000 SF of CANOPY. Properties with other ZONING designations do not allow this much Cannabis Cultivation Canopy area for a parcel of this size making this property much more valuable. For Certified Organic agricultural land like this (eg. for growing strawberries) lease rates are about $3000 per acre per year, and the home on this property could be leased for approximately $2250-$2500 per month. This property was purchased in 2017 by an Organic Commercial Farmer, who has been farming it for 12 years, for $600,000. It was a friend of the family transaction based on a lengthy historical business relationship without being marketed to the general public. Their purchase price did not reflect the current market values for CA zoned land with the potential for licensed Cannabis Cultivation. Parcels like this are extremely rare and sought after, and rarely make it to the Multiple Listing Service. 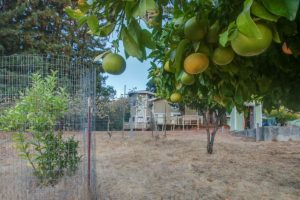 Similar CA Zoned agricultural properties without a home have recently sold for up to $83,000 per acre. This is an EXCLUSIVE santacruzcountyre.com Real Estate listing. For more information on this 9+ Acre Santa Cruz Property contact Dianna Glidden (831)588-9888 or Mark Foxx (831)234-7001.
age, curing or various other uses in addition to solar panels for power. Owner has already consulted with an engineer to install a hydro-electric dam in the stream to add even more power to property. Please call (800) 310-1948 or visit our cannabis real estate directory for more information. 41 acres zoned agriculture only 100 miles from golden gate bridge, with a modern architecture dwelling and guest/caretaker quarters. additional two 40+/- ag parcels to maximize production. www.high-altitude.net. 1.275M for parcel with house, cottage, vineyard. 2 additional adjacent ag parcels with wells (not sold separately) for 499k each. Beautiful 15 acre farm in Central Point, Oregon. Approved for both OMMP and OLCC production and growing on separate tax lots. This EFU property is LUCS approved with 2 separate tax lots and addresses. Land meets criteria for multiple Tier 2 rec grows. 13 acres of water rights from 40 gpm well, available year-round. There are 2 homes, one on each tax lot. Large home ~3000 sq ft and second home ~1200 sq ft. Large warehouse ~3000 sq ft could be used for indoor grow, drying rooms, or processing. It currently contains a residential kitchen that could be converted to a commercial kitchen/extraction lab (non-chemical extraction). This property is approved for an additional 10,000 sq ft processing building which could be built. There are 3 greenhouses: 48ft x 144ft, 30ft x 100ft, 20ft x 100ft. Largest greenhouse has underground radiant heat. This Farm is located near the end of a dead-end road and is surrounded by farm land. Very quiet and private yet only a few minutes to town and freeway entrances, etc. Looking for serious, honest professionals who can provide proof of funds and ability to sustain a 3-5 year lease. Only interested in professionals willing to meet and maintain requirements for legal, permitted grows. Will lease whole farm including all buildings to one entity for $15,000 per month. Only serious inquiries. Property is ready to lease now. Interested parties must be ready to move forward in a timely manner. Wine!! or Weed Potential?! Wildrose Vineyard and Winery: 41 acres with 3200 sq ft home and 3200 sq foot building!! Make your dream a reality! Own a taste of paradise hidden in the rolling Umpqua Valley Hills. Over 41 acres with 10 acres planted vineyard Established in 1995 using “old world” viticulture practices resulting in wines produced with deep complex flavors & exquisite bouquets, highest level of flavors possible. Avg yields at 1 ton per acre, w/approx. 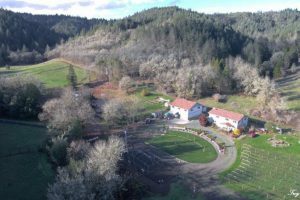 500 cases per yr. Well kept 3200 sq ft home built in 1995, 3200 sq ft storage/winery building w/tasting room and retail space, 200 sq foot restroom building, creek, large pond, & room for events. Buyer due diligence for uses! We thought with a distribution Licence, that our area would be able to move legally, but the state will not give distribution licenses.